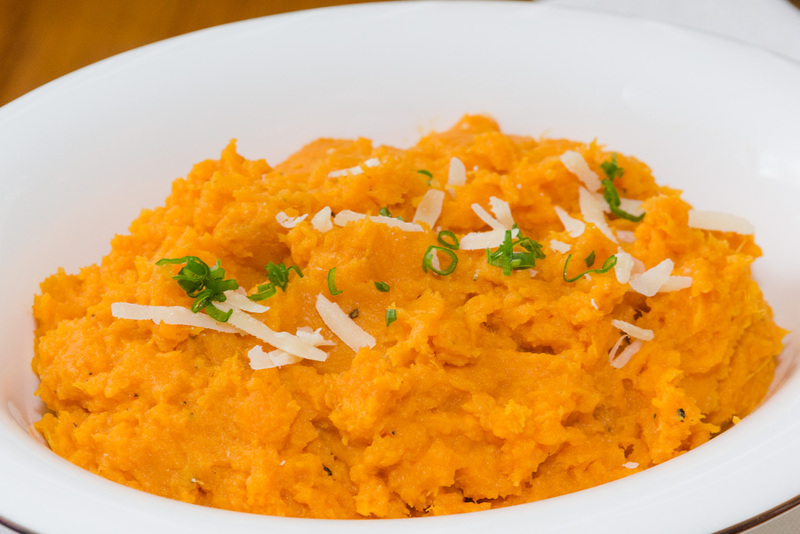 Some time ago, we swapped out sweet potatoes for white potatoes when it comes to all things mashed. 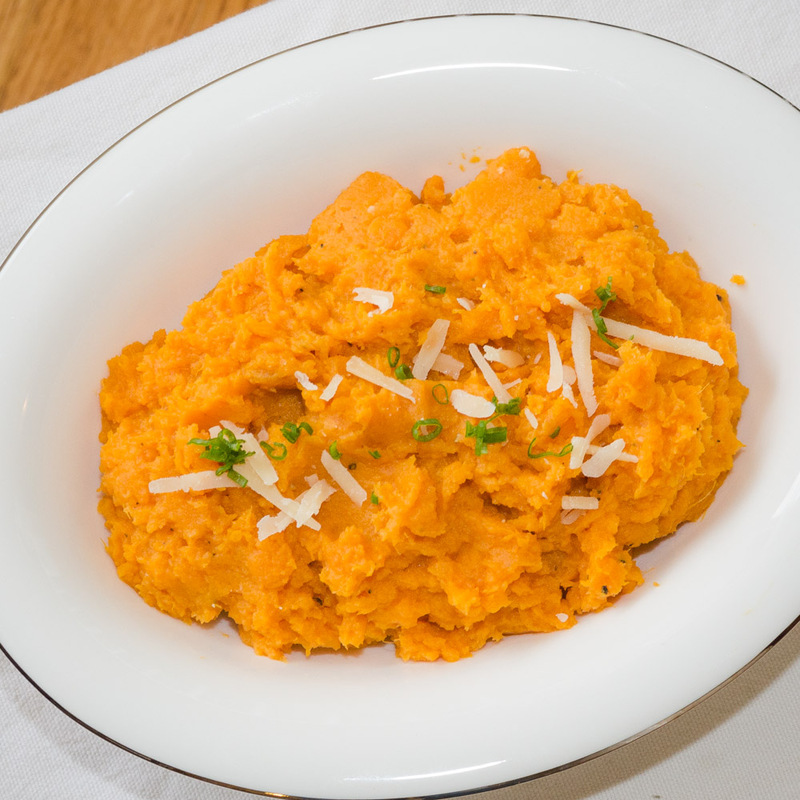 You don’t need me to tell you about all of the nutritional reasons for this switch, but I would like to share some ideas based on our favorite way to make mashed sweet potatoes. As far as cooking the potatoes go, it’s almost always done in the microwave for the time savings. Granted, baking sweet potatoes (or even grilling them) is going to give a sweeter, more complex flavor, but that’s a much longer process. However, if you’re already doing some grilling, or have an oven at 425 degrees for another purpose, that’s a good alternative. After a good scrub under warm water, I’ll poke each of the potatoes thoroughly with a fork and lightly wrap them in a paper towel. While our microwave has the seemingly helpful “potato” button, it has never actually cooked a potato all the way through. Depending on the size of the sweet potato, and how many you are cooking, it’s going to take anywhere from 7 to 10 minutes to cook a sweet potato in the microwave. Cook half way through on one side and then carefully turn them over. You’ll know they are down when they are squishy in the middle of the potato. Just to make sure, try and push a butter knife through the potato. If a knife slides through the thickest part of the potato without any resistance, you’re all set. Next, let them rest, or you’re going to get some wicked steam burns. Once cooled, slice them in half and scoop the potato them into a mixing bowl. I’ll toss in some butter (about 1 teaspoon per potato) and work them over a few times with a potato masher. Next, add some orange juice. Probably about 1 tablespoon per potato. I’ll switch here to a fork to blend the juice in thoroughly. Next, add a little honey. You’ll want to do this to taste, and it’ll vary depending on the sweetness of your potatoes. If you have fresh ginger, grate some and mix it in as well. Ginger and Sweet Potatoes go great together and this adds a little bit of bite to balance the sweet. Finally, season as needed with salt and pepper. That’s it! Super simple. Very delicious.